This is the second in a series of articles we are releasing as part of our 10 year anniversary. The author, Joyce Moock, is a former Associate Vice President of the Rockefeller Foundation and was instrumental in founding FORUM, the predecessor programme to RUFORUM. Click here to see our first release where we announced the anniversary celebrations. In over a little more than two decades RUFORUM has evolved from a regional, crop-based network of five agricultural faculties into a blockbuster regional consortium of 32 universities in eastern, central and southern Africa. 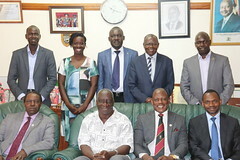 It is now a wholly African governed and managed network with a Secretariat, housed at Makerere University, which provides the platform for catalyzing change in African higher level capacity building.